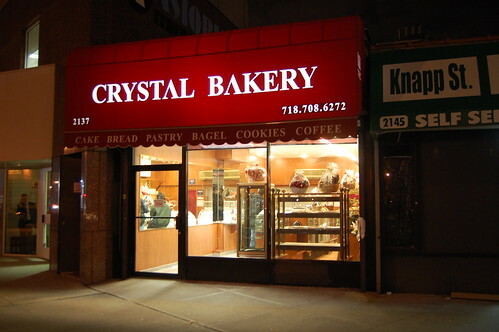 32 comments to Crystal Bakery Open! where are the rainbow cookies? Formerly Leon’s, of blessed memory. Do they make a good rye bread? How are the black and white cookies!? I went there yesterday to buy rolls as Morretti had none! the bakery is clean, they had a LOT of cookies but 3 rolls, not like any type of roll I’m used to (not that that is bad) so I bought my rolls at Keyfood. I need to go in there and try them. whoa! been waiting for a bakery here for years…tried their cookies, was nice and fresh. i recommend the cheese cake too. I have a question! Are you using the same recipes as Leon’s, and are there rainbow cookies, and brownies? What about the chocolate marble ring?? I think we need to let Leon’s go and give Crystal a chance, you need to have an open mind, as Crystal said, they just opened and are finding their way. I am sure they will be good, I always patronize Gerritsen Beach merchants over others because I support my neighborhoods. For all of it’s faults I still love living here. so what did u buy? I went to Crystal in January. The place is really nice, clean and had a really good variety of stuff, but the cookies and ruglugh??? that I bought were a little on the dry side that day. I didn’t notice if they carried the breads/rolls that Leon’s used to carry – that would be a huge plus only because there aren’t many places to get that sort of stuff anymore (deli’s are a dying breed around here). They should use Leon’s recipes if they have them. Mix n match. I haven’t had a good rainbow cookie in ages. Try Vito's bakery on Avenue U and East 21 street- they have great rainbow cookies. We can’t let Leon’s go! They were too good! Somewhere, someone must know the old recipies and may be willing to sell them to you. Perhaps relatives of the former owners (before 1990). My personal favorites were the butter cookies with a thick, very chocolate swirl and either a lemon or cherry flavored dot on top. Then came the rainbow cookies that had thin layers of jam or jelly between the different colored cake layers. The old Leon’s also made a chiffon marble cake to die for! I think they put a little instant coffee into the chiffon. Who knows? It was great! Next time i’m in brooklyn, i’ll try you guys out. I do remember, when i was a wee lad (1960’s), that the ladies behind the Leon’s counters spoke with accents. I seem to recall hearing that they were from Austria. Perhaps, when they came over, they carried the secret Leon’s recipies hidden in the false bottom of a suitcase. In any case, perhaps the recipies live on in Austria or Austrian pastry books. Perhaps this could work. I’m gonna try it one day..
crystal bakery is pretty good! their rainbows are delicious. they are just as good as leon’s. 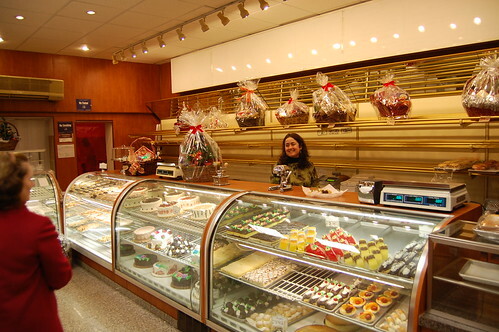 i am so glad that there is a bakery near my house and they remodeled. good luck crystal bakery!! Let's set the record straight. My dad Willie owned Leon's Pastry Shop. He began working there in 1953 and later purchased the bakery from Leon (with Mel) in 1969. He passed away before Crystal Bakery opened The recipes for the delicious cookies, cakes and breads are in bakery heaven with my beloved dad. Can I get the onion-rye bread without going to heaven? We miss him so much, a shame that the recipes were not handed down so everyone could still enjoy what he created. Holidays are not the same without Leons cakes. I have not found another Bakery to compare. I just read your post regarding Leons and it made me cry. I clearly remembered that you stayed with me during a wedding for someone in Mel’s family. My dad, Mike Gaeta, worked in the bakery for years, as did my brother-in-law, Herman Spiegel. My husband and I and Camilla and Hermann live in Florida. We all miss Leons and our loved ones who are no longer here. I went in there once to buy crumb cake. Since they didn’t have any, I purchased some rainbow cookies instead. I paid with a $50 and the girl shorted me $10. When I pointed this out to her, she snatched back the money, recounted it, added the $10 and pretty much threw it back to me. I have not been back since. The cookies were ok.
Is Crystal Bakery open on Saturdays? Stopped by yesterday. Place was empty. Sign said that the retail operation had been discontinued. End of an era. This place is trash, total waste. Leon's was one of the best bakeries around. Their Rye bread was awesome, their chinese cookies were to die for and they had the best strawberry shortcake and chocolate banana cake i have ever tasted. It is a shame that this wanna be bakery has replaced such a good fond memory.